Andhra Pradesh was formed on 1st November, 1956 under the States’ reorganization scheme. It is the fifth largest State with an area of 2,76,754 sq. km, accounting for 8.4 % of India’s territory. The State has the longest coastline (972 km) among all the States in India. The administrative structure of Executive Government is “the framework within which the permanent civil service operates under the supervision, control and direction of the political executive coordinating the different parts of the machinery and interacting with other Government agencies and the world outside Government” (UNDP – Civil Service Reforms). Machinery changes are often brought in based on an expectation that better structures will produce better results. Adhoc structural reforms in some countries till the early 1990s had relied more on “legislative changes superimposed on outdated organizational structure rather than based on an in-depth analysis of structural problems themselves”. Now there is a holistic approach to such reform through functional reviews which seeks to balance “a focus on internal reform with a concern for changing relations between public administration and society” (UNDP Public Administration Reforms) with primary functions of redefining roles, missions and functions of different layers of administration, identifying redundancy and duplication of functions, new functions and the possibility of rationalizing functions that need to be continued, backed by a statutory framework and staff appropriate to the new roles and functions with requisite levers of horizontal and vertical coordination. Structures can be rationalized to create strategic mechanisms and processes for policy and decision making coordination. It has to be borne in mind however that mere structural reform is not a panacea for improving public service delivery. Equally important is to have good personnel to run the machinery. Even bad structures can work under able hands but the opposite cannot always be so. A brief historical overview of the Andhra Pradesh Secretariat would take one back to the Madras Settlement of the English East India Company and the British Government and the Nizam’s Dominions. A small fort which came to be known as the Fort St George established on the Coromandal Coast in 1640 is even today the seat of the Tamilnadu Secretariat. The Tamilnadu Secretariat started with the Public Department in 1670 with a Secretary who dealt with all business of Government. (The Public Department, as pruned over time exists even today as the department of the Chief Secretary, the equivalent of which is the General Administration Department in Andhra Pradesh). The Secretariat also kept on expanding with the territorial expansion of the colony over time; and new departments got created one by one like the Military Department in 1752, the Revenue Department in 1774, the Secret Department in 1796 and the Judicial Department in 1798. The five Boards viz., the Board of Revenue, the Board of Trade, the Military Board, the Hospital Board and the Marine Board were constituted for field administration in 1786 with subordinate departments placed under the control of these Boards. (The Board of Revenue continued to exist in Andhra Pradesh as a field coordination department till the 1980s) The post of Chief Secretary came into being in 1800 with three other secretaries with Chief Secretary holding charge of political and secret departments. Finance department got established in 1811 and a Law Department in 1815. In 1831 the Chief Secretary came to be in charge of political, secret, and public department which comprised Finance, Law, Commercial, Ecclesiastical and General Branches. Ours is a Parliamentary system of Cabinet Government following the Commonwealth tradition with the three wings of Executive, Judiciary and Legislature; with a legitimate system of delegation from the Legislature to the Government, and within Government, from the cabinet to ministers and from ministers to departments and agencies. Parts V and VI of the Constitution deal with the Union and State Executive respectively. Article 154 of the Constitution vests the Executive power of a State in the Governor, who is required to exercise it, either directly or through officers subordinate to him, in accordance with the Constitution. 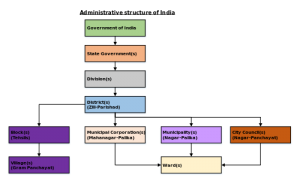 The executive structure of Government of a State comprises two parts viz., the political executive represented by the Council of Ministers headed by the Chief Minister and the administrative structure comprising the permanent Civil Service discharging staff functions at the centre of Government and line functions in the field. Executive Government thus involves bringing these two groups of players in a harmonious way together to discharge its responsibilities to the citizens. The two are brought together in the Government Secretariat. The Secretariat can be said to be the administrative headquarters that serves the Head of the Government, the Council of Ministers and the Ministers. The main responsibility of the secretariat, which is not purely administrative in the sense of executing orders of the Government or the Minister, is derived from the collective responsibility of the Ministers constituting the Council. By its very nature it has “one foot in the administrative world and the other in the political world. These organizations are the buckles that link the political and administrative, and as such are the crucial elements in any process of governance”. The secretariat therefore has to “simultaneously manage up to ministers and manage down to public service departments and their managers” and “manage out by relating the work of Government to private sector organizations and NGOs”. Each secretariat department may have, in its charge or under it, field organizations which may be statutory authorities, heads of departments, statutory corporations, Government companies, cooperatives, societies, or other institutions which are collectively called “instrumentalities of the State” in terms of Article 12 of the Constitution. Regular Heads Departments under Government are obliged to act in accordance with the laws, rules, codes and procedures laid down by the Government, where as agencies like corporations, societies etc., set up by Government for the purpose of discharging development / welfare etc., functions of Government are not subject to such discipline and have liberty to formulate their own rules and regulations for conduct of business and control of personnel. Heads of Departments are notified by Government for the purpose of Financial Budgetary functions and for purposes of cadre control of Civil Servants. Heads of Departments are notified by the Finance Department for finance purposes and Heads Department for the purposes of cadre regulations by the General Administration (Services) Department. An alternate modality of devolved district / local governance is sought to be achieved through devolution of powers under the Constitution to local government institutions. The Article 243 contemplates a three tier hierarchical structure for the rural local bodies at the village, intermediate and district levels which in Andhra Pradesh are called the Zilla Parishad, Mandal Praja Parishad and the Gram Panchayat. Similarly urban local bodies constituted under Article 243 P to 243 Z A. contemplate a Nagar Panchayat for a rural area in transition to an urban unit, a municipal council for a small town and a Municipal Corporation for a city. The provisions relating to the panchayats and municipalities as they stand today are the result of the 73rd & 74th amendments to the Constitution which introduced new 11th & 12th schedules in the Constitution listing subjects allocated to the third tier of Government. The 11th schedule lists 29 subjects which may be entrusted to Panchayats by the State Legislature at its absolute discretion. Similarly the 12th schedule lists 18 subjects in relation to urban local bodies. In so far as the State Government has full legislative and executive powers in respect of State subjects, some of which are listed in the portfolio of the local bodies, the extent of powers of local Governments in respect of these subjects is entirely subject to the discretion of the State executive and legislature.